Casino table games with friends! 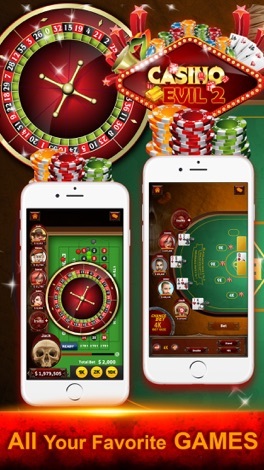 The best casino app featuring Multi-player craps. 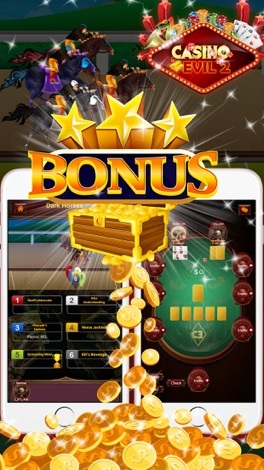 Play poker and slots with your friends. Vegas-style games, including Blackjack, Hold 'Em Poker, Roulette, and dozens of wicked themed slots. Casino Evil gives you the shot to WIN BIG. We have one of the best-looking and most exciting apps on the play stores with some awesome spooky themed graphics, tables and games. Collect your daily prizes with our daily spins, hourly chips bonus, and freebies! We start you off with 100,000 free chips just to try it and give you free daily spins for a chance to win up to 100,000 free chips each day. Invite your friends to play alongside you at a table for blackjack, poker, roulette or a slot machine. Each player gets a unique player "friend code" that you can share with your friends to challenge each other. We also have a leaderboard and keep up with the top-ranked players each day. Feeling generous? You can 'gift' another player with some of your chips. 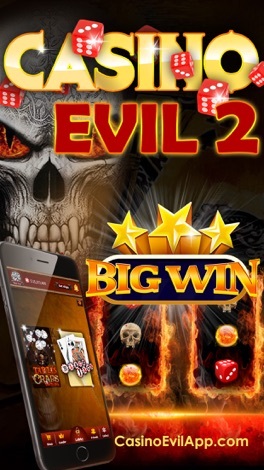 The Casino Evil is fun to play and exciting to WIN! Casino Evil casino games are great fun on many levels and put the FUN and EXCITEMENT of the real casinos right in your hand. 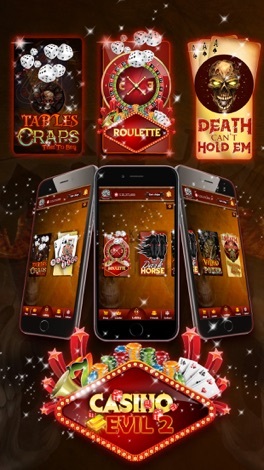 Casino Evil has just added the world's only multi-player craps game. Play with your friends! Coming soon will be Sinners' Solitaire and Video Poker. Disclaimer: Our games are for entertainment only and intended for an adult audience. 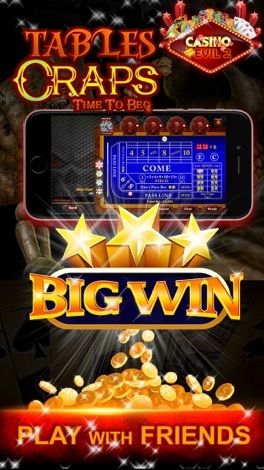 We do not offer real money gambling or an opportunity to win real money or win real prizes. Practicing on our games does not imply future success at a regular casino. If you are addicted to gambling, betting, winning or competition, please seek professional help. Our games are designed to be a fun, interactive way to enjoy casino-themed games with your friends. The St Mary and St Martin App is built by Liturgical Publications Inc. Our app features include: • Notifications of important parish news, events and communications • Mass times • Parish contact information Latest bulletins and publications • Events calendar • Parish staff • Parish blog • News • Daily Bible readings and much more. Good Shepherd Tabernacle is a fully fledged church and ministry management system that helps in managing administration and collaboration between the members.